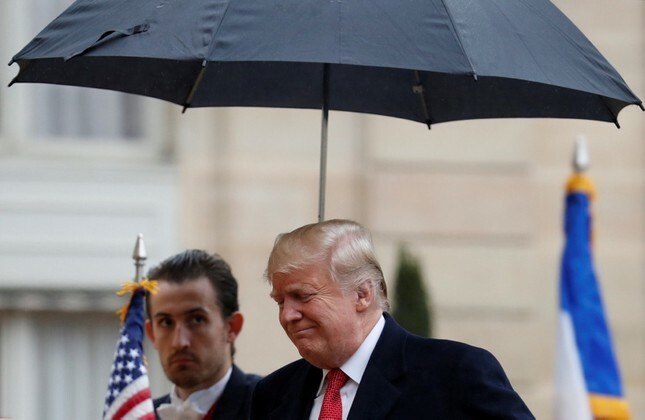 U.S. President Donald Trump came under fire on Saturday after canceling a visit to an American World War I military cemetery in France because of rainy weather. Trump, who is in France for commemorations marking the centenary of the end of the war, and his wife Melania were to have flown by helicopter to the Belleau Wood battlefield and cemetery where U.S. Marines faced off against German forces in 1918. Instead, Trump sent his Chief of Staff General John Kelly and Chairman of the Joint Chiefs of Staff General Joe Dunford in his place to the site, which lies 80 kilometers (50 miles) northeast of Paris. Some saw Trump's no-show in Belleau Wood as a sign of disrespect to U.S. soldiers who fought and died in the trenches. The visit was one of two Trump had planned to war cemeteries on a weekend coinciding with Veterans Day in the U.S.
Trump was compared unfavorably by some to his Democratic predecessor Barack Obama. But while some questioned why Trump had not made the hour-long journey by road, White House insiders noted that organizing a presidential motorcade, typically involving dozens of vehicles, would be a tall order at the last minute. On Saturday, Macron and Merkel traveled to Compiegne in northeast France to unveil a plaque in the forest clearing where the World War 1 armistice was signed.